This stable, flashy, gorgeous and confident 9 month old puppy girl earned a 3 point Major at her very first dog show!!! 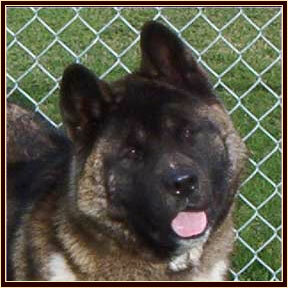 Our Onyx girl was 90lbs, 26 inches tall at 9 months. Onyx is one of Ch. Kid Rock's most confident ever produced pups to include Onyx's sisters Ch. Nissan (Ch. Summit Enjoy the Ride Kuroi Kao), The 2004 A.C.A. 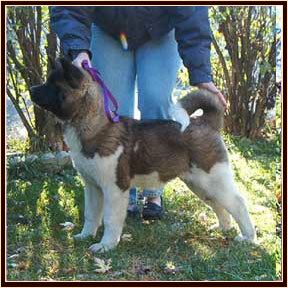 National Specialty GRAND FUTURITY WINNER AT 9 MONTHS! and Ch Honda! 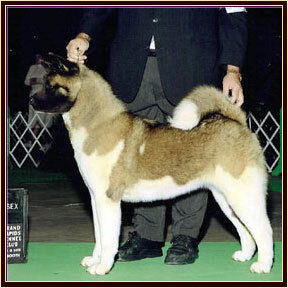 © Copyright 2001-2008, Summit Akitas.